You won’t be sleeping in a tent or living off the land to prepare for your wedding dance, but if you plan on surviving and dancing in front of 100’s of your peers, co-workers, family members, and friends you must pay close attention. Research these tips on how to survive your wedding dance. In our blog “How to Survive Your Wedding Dance,” we will be covering common mistakes and will be providing simple tips on how to be your best on your wedding day. 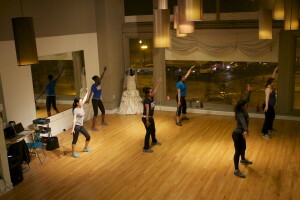 Windy City Wedding Dance is a ballroom and social dance studio located in the heart of downtown Chicago on Michigan Avenue. We focus on delivering high quality dance instruction for clients who are interested in learning how to dance for a wedding, preparing for a special event, or who want to study how to become better dancers. Good Location Find a wedding dance studio that is conveniently located close to your work or home that you can visit easily. It does no good to book a dance studio that’s out of reach. You must attend your dance lessons in order to learn how to dance. Trying to save $5 to $10 dollars a lesson could cost you much more in Taxi’s and Ubers once you add up your final bill. Check out reviews to make sure they know their stuff. Book Steady and Consistently Make sure to book steady and consistently especially in the beginning. 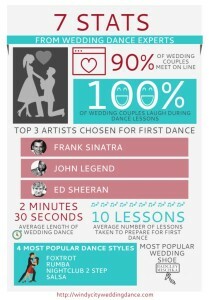 Creating muscle memory is important to ensure you remember how to dance on your big day. By the time you take your bride to the floor you shouldn’t be thinking, but just enjoying your first dance. 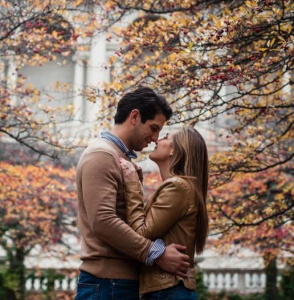 On average most couples take 10 Lessons. Forget the Word choreography the word choreography spikes the blood pressure and makes many of us want to stick our head in the sand. This doesn’t have to be 5,6,7,8 on the first dance lesson. Let’s learn how to dance starting at the very beginning. When you skip learning a foundation on the dance floor it shows. Are you dancing to the music or just mimicking a YouTube video. If dancing at a high level is something that you are striving for, then just be prepared to put the work in on the dance floor. Be Kind Demonstrating your support to one another shows great hope for a successful partnership and supportive future. Learning how to dance together is often one of many highlights of our wedding couples. Be prepared to laugh, not at each other, but ourselves. Dancing creates immediate laughter and joy. Give words of affirmation and encouragement. Waiting Until Last Minute As you can imagine procrastination creates stress and anxiety. In the last 2 months leading up to your wedding you will attend 10 to 20 appointments that are all about your wedding. Over the summer months you will be traveling to other weddings, vacations, or have other life events taking place. As soon as you blink its wedding time. Call us at the beginning of the year and get your dance lessons scheduled early. You can always video your first dance so you can practice at home. Come back in for a refresher lesson before the wedding so you can get your steps back together. 2017 will mark our 4th year in the Chicago wedding market and we have loved our journey here in Chicago. We offer lessons 7 days a week at 410 S Michigan Avenue. We also offer lessons in Lincoln Park and Naperville, Aurora. Our Lincoln Park satellite location has restricted hours and space is rented on behalf of the client.